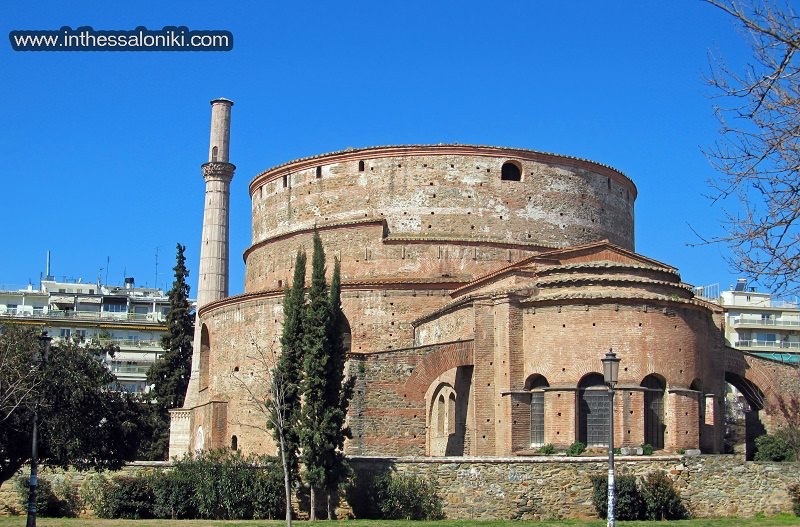 From inThessaloniki.com comes today’s MotD: the Rotunda of Galerius located in Thessaloniki in northern Greece. While the outside may see simple and without decoration, the inside of this ancient structure contains beautiful Byzantine tile. The cylindrical structure was built in 306 AD on the orders of the tetrarch Galerius, who was thought to have intended it to be his mausoleum. It was more likely intended as a temple; it is not known to what god it would have been dedicated. The Rotunda is an austere structure built entirely of brick on a circle-within-a-circle plan with 20-foot-thick walls. To transform it into a church, Thessaloniki’s Christians converted the southeast niche into an arch, added a sanctuary, moved the main entrance from the southwest to the northwest side, added a narthex, and built another ambulatory around the outside (which has not survived). The slender, freestanding Turkish minaret is the only one to survive in Thessaloniki. The interior was covered in glittering Byzantine mosaics, of which only a few fragments survive. Most of the damage was done by earthquakes over the centuries. They mosaics are Hellenistic in style and are some of the finest examples of mosaic work to survive from this period. The quality of the work and complexity of the job suggests to some scholars that the workers were from Constantinople, probably sent by the emperor. So here is a structure that has withstood time and nature AND three religions. It’s now a deconsecrated museum. Proving yet again our connection to God, Source, Universe, or whatever name we wish to use to designate that which is Beyond our Consciousness, has little to do with our human-created structures and more to do with our own inner Spiritual connection. Reminding us: that which we Seek comes from within.